Luis Vasquez, one of the famous Vasquez brothers, his wife Joby and Janette Valenzuela founded the Salsa Brava Dance Company in 1994. Their specific style of dancing Salsa is renowned all over the world. They mix the Salsa from the street with jazzy moves and flashy show. 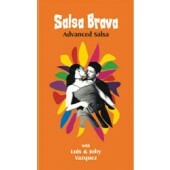 Salsa Brava teaches on1 and Salsa Brava Dance Products are available on Zone Free DVD.